I'll put you down on the list. Applications closed, I'm resuming my turn. I'm not going to hide the new report into edit of my previous post, so sorry for double post. I've spent today by pondering who will be our new secretary. I've decided to let Avan Babinushat do it. She doesn't find most jokes humorous, is very quick to anger, is prone to strong feelings of jealousy and is stubborn. Can you think of a better clerk? She is going to need an office. Which brings me to another thing and that is layout of our fort. It is nice, but I can think of some improvements. 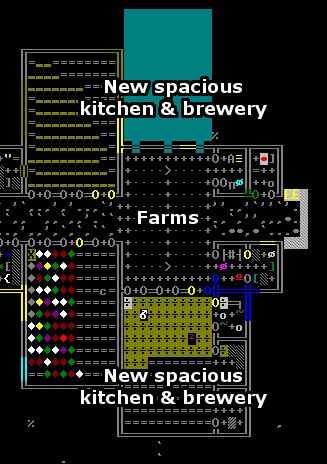 Once we'll set up a cozy tavern, all traffic to the metalworks is going to go right through it. I want to be able to enjoy my booze in peace and not be disturbed by noisy haulers dragging ores and whatnot. 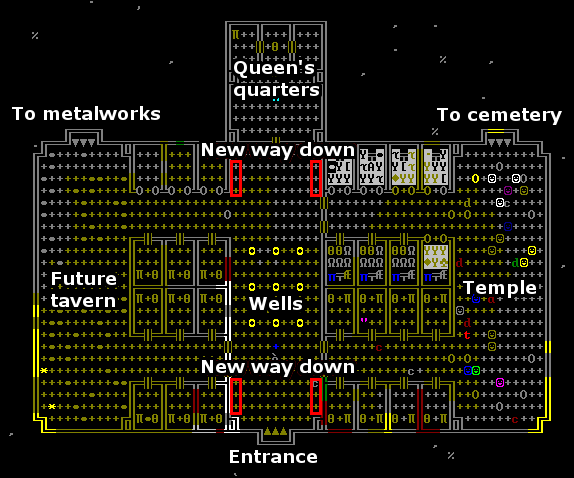 So I'll have new ways down channeled in the center hall, so that tavern will not be a transit area. Also, it will open a new areas to be dug. They're spacious, aren't they? I like them! I want woodworks and stoneworks and other whateverworks to look like that as well. So I'll have them dug out. Once they're moved, we'll have free space around farms to make a cozy, spacious foodworks as well. Sounds good! 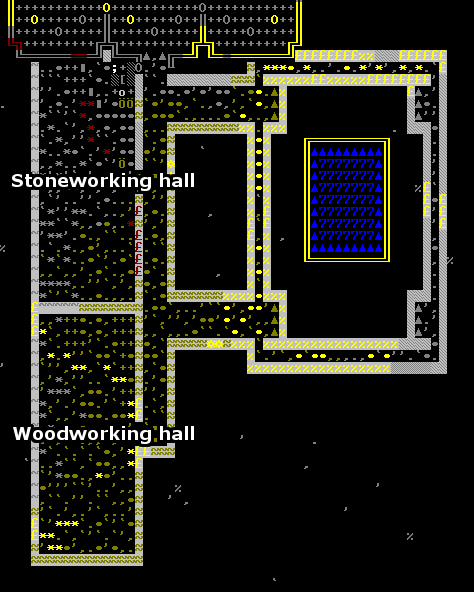 I usually have my woodwork/stonework etc areas fairly cramped like that for efficiency haha, just so I can get it all together and move on to quarters before anything really happens. Old habits die hard had I more time I'd have done exactly that and expanded them. Okay, I haven't foreseen this. Dwarfs should be extinct, premise of this succession game is to start with as few dwarfs as possible and slowly repopulate the world. Yet a massive migrant wave of 18 just arrived, effectively doubling our dwarfs. I'm going to savescum a bit and set pop cap so they won't come anymore and we'll have to rely on our dwarvettes to do the repopulating. I mean there is no way I'm letting this last dwarfs in the world challenge turn easy mode by doubling our dwarf power in a single moment. 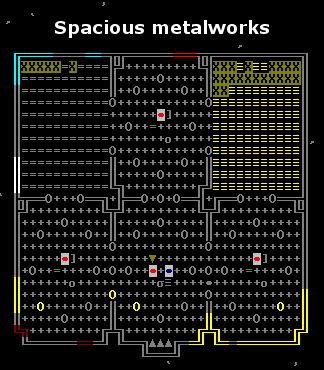 18 dwarfs is a nice number, not too little, yet I have to keep lack of dwarfs in mind. 36 is more like my everyday fortresses, which I cap at 50 dwarfs for fps reasons. I checked Legends, before I embarked the five necromancers were literally all that's left. "The third migrant wave and on are influenced by the created wealth of the fortress, with more wealth attracting more immigrants (more research is needed to determine specifics). Specifically, they're influenced by the fortress wealth as reported by the last outgoing dwarven caravan. Wealth created after the caravan leaves has no influence until the next year's caravan leaves. If the caravan fails to make it out then the fortress' wealth is not reported. The dwarven liaison does not report on fortress wealth, in those circumstances where the liaison makes it out but the caravan doesn't." If it's created wealth, the size of the migrant wave may have been my bad. I went trigger-happy creating shell crafts and stone works (hence the shitload of decorated statues) along with cut gems and shell decorations etc. which may have attracted so many people. The fact that we got a third wave at all perplexes me, imma do some research. I savescummed, I had a save not long before they came. I'll just have to redesignate some areas and deal with damp stone cancellations below the water pipe again. Feeding those dwarfs would be easy, too easy in my opinion. Cool. I'm not too fussed about more migrants turning up as it's more of a gene pool and more workers without a 12 year wait, but we do like a challenge Still no idea why we got a third wave. Oh speaking of pregnancies, any luck with the marriage rooms yet? I assigned a few couples (including the queen, want to get a dynasty going haha) before I handed the save over but forgot to turn off their labours so they stay in their rooms. Marriage rooms are those rooms filled with statues, where dorfs cannot reach the table nor cabinet? Well, I'm trying to keep idlers at 0 so far (there is work to be done), so I didn't have dorfs hanging around yet. Editing the d_init.txt prevented immigration. This. Civilization. Is. Dead. First batch of digging is complete. I've ordered bookkeepers office to be furnished. Let's see what we have on hand, once she gets to work. Aban, our bookkeeper and manager, finally put things in order. Her findings are alarming, we are completely out of booze. I'll have her set up a standing work order for our still to make sure this never happens again. Once this is dealt with, I'll make sure we have a steady production of stone blocks. Those damned bunnies are driving me crazy. Little bastards keep running out of their pen and sapping our dwarf power constantly as dorfs catch them and lead them to the pasture all the time. I'm going order a wall build around them, solving this issue. If Dorfing is available, stick me on the future list.